Coconut Oil is a staple in our house. I have been using it long before it became so popular. I figured everyone knew how awesome it was otherwise I would’ve started spreading the word a long time ago. My bad. There are 100’s of uses for this miracle oil. I don’t use it for 100’s of things but these are my top 15 favorite uses. Coconut oil is anti-microbial, anti-inflammatory, anti-fungal and an antioxidant so it seems like the uses are endless. If you haven’t used it before, coconut oil comes in a solid form and melts very easily. You can scoop some out of the jar with a spoon and warm it in your hands, it will melt immediately. Since i keep a jar in the bathroom and it’s always warm upstairs my jar is usually in a liquid form all the time. Like I said, it melts very easily. There are 2 kinds of coconut oil. There is REFINED and UNREFINED. REFINED: Refined does not have a coconut smell or taste. It is still good to use but does lose some of it’s health properties during the refining process. Sodium hydroxide is frequently added to prolong shelf life. The oil is extracted from the dried coconut meat that’s been bleached and deodorized and they use chemical solvents to extract as much oil as possible. They may partially hydrogenate the oil too (a trans fat). UNREFINED: Also known as “virgin” or “pure” coconut oil and has a great light coconut taste and scent. I actually don’t notice it at all but maybe that’s because I use it so much. It’s oil is extracted directly from the fresh coconut meat. 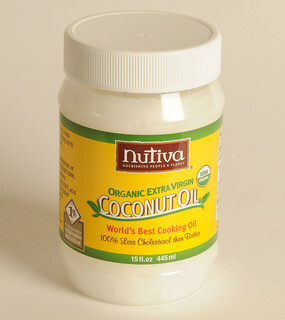 Unrefined coconut oil retains the most nutritional value and is superior to refined oil. I solely use organic refined coconut oil always, I don’t have a strong preference for one brand over the other as long as it’s organic refined. Deep hair conditioner: Once a week I will coat my hair in coconut oil. I just scoop some from the jar I keep in the bathroom which is where I use most of my coconut oil. Melt it in my hands and apply to my hair. I get my hair nice and saturated, cover with a shower cap and sleep on it overnight. The next morning I wash my hair as usual. I usually only need to shampoo once to get all of it out but some people with very thick hair may need to shampoo twice. After shampoo’ing either once or twice, apply your normal conditioner and style as usual. My hair turns out so silky smooth and hydrated. I love the day after the coconut oil treatment. Toothpaste: Not too long ago I started educating myself on the poison known as fluoride that is in our drinking water and tooth cleaning products. I threw away all of our toothpaste before I had the chance to purchase organic fluoride-free toothpaste. I didn’t exactly think that one through so I made some. Because coconut oil is anti-microbial, anti-inflammatory and anti-fungal, it makes a wonderfully effective toothpaste. The recipe is so easy too. RECIPE: mix 2 tablespoons coconut oil (melted), 2 tablespoons baking soda, a packet or 2 of stevia (to sweeten up) and peppermint extract (to taste). If the mixture is too runny, just add more baking soda, if too thick add more coconut oil. It’s so easy. Just remember to add the equivalent of baking soda to whatever amount of coconut oil you use. I put mine in a mason jar. After Shower Moisturizer: I use coconut oil as a skin moisturizer all year long. I keep my coconut oil within reach of the shower so that when I’m all done rinsing I scoop out a small amount and apply all over while I’m still wet. Then I pat dry so not to wipe away all of the coconut oil. My skin loves it and drinks it right in. It doesn’t stay greasy after it soaks in either. Shaving Cream: Instead of soap or store bought shaving cream, I just scoop some coconut oil, spread on my leg and shave away. Talk about super soft legs! Just be careful because the shower can become slippery afterwards and for the next person. Having a bathmat really helps. I warn the hubby that I used it so he knows to step in the shower carefully just in case there is any residue. Eye Make-up Remover: I used to use expensive department store eye make-up remover until I discovered coconut oil. I use a cotton round and coconut oil to remove all of my eye make-up, even the tough waterproof mascara. Not only does it take off my eye make-up like a boss but it conditions my eye lashes. Under Eye Moisturizer/Wrinkle Reducer: After taking my eye make-up off I swipe my finger in the jar and apply a thin layer to each under eye so it soaks in while I sleep. My skin is nice and soft in the morning. This works just as good as any wrinkle reducing serum I’ve bought at the store. Fly Away Tamer: When I need it, instead of using expensive serums for fly aways, I just take a very small (I mean very small) amount in my hand and apply it as a finishing serum. Start with the smallest amount you can imagine, you’ll be surprised how far it goes. It gives my hair beautiful shine! Eczema Relief: I live in the Midwest and no matter what I do, occasionally I get dry patches due to the extreme cold. Nothing store bought seemed to help so I thought, “why not try the coconut oil, it works for everything else”. Ta-da, it helped relieve the redness, flaking and itchiness of the dry patches and more importantly healed them. Deodorant: It’s happened to everyone at least once, you don’t realize you are out of deodorant until it’s too late. In a pinch, you can use coconut oil! Since it’s an anti-microbial and anti-fungal, it will keep the stinky away. It’s not an antiperspirant so you will still sweat if you are a sweater but you won’t stink and your underarms will be nice and soft. You don’t need a lot to use it as deodorant, just a thin swipe will do. Grease Pans: Whenever a recipe calls for greasing a pan or using butter to cook something in, I use coconut oil instead. It works better than butter as it as a very high heat tolerance and won’t burn like butter. Leather Cleaner: I especially use this in the winter to clean the salt off of my leather boots. Just use a washcloth with some coconut oil it and rub that salt right off. It moisturizes the leather beautifully. Replace Butter in Recipes: I use coconut oil in place of butter (exact amount by exact amount) whenever I cook something that calls for butter. Dry Heel Healer: If you’ve got dry heels, slather on coconut oil on your feet, put socks on and sleep. Wake up with softer feet! I also massage it into my cuticles on my hands. Sugar Body Scrub: Get a mason jar and mix a 1/2 cup of coconut oil, a 1/4 cup of sugar and a few drops of vanilla extract. You can add any essential oil, I just happen to love the smell of vanilla. Use in the shower and exfoliate. Again, be careful of the tub being slippery. Tattoo Care: I rub in coconut oil into all of my tattoos. It makes the colors pop and moisturizes the skin to help keep the pigment from fading. And any time I have a little extra on my hands I always wipe the excess on my elbows, why waste it? There you have it, these are my top 15 things I use coconut oil for on a regular basis. I use it every single day in one capacity or another. Not only does it save us money but it’s so much better for us inside and out. Better than any store bought beauty product. So go pick up a jar and you just might be using it every day too. This entry was posted in Natural News and tagged Antifungal medication, Coconut, Coconut oil, cooking, deodorant, dry skin, eczema, Hair conditioner, Health, lotion, make up, moisturizer, Refining, remover, shaving cream, toothpaste, wrinkle on February 27, 2014 by Bunny.